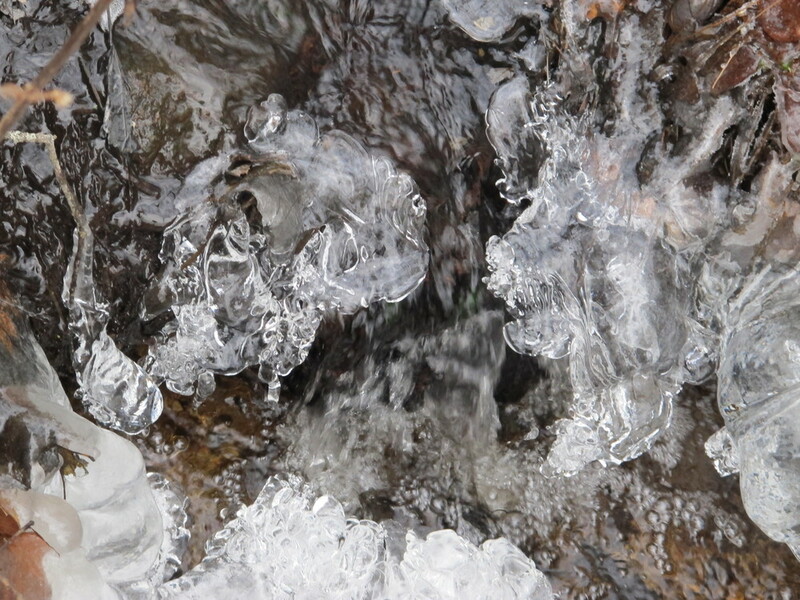 A roadside stream on Christmas afternoon. Bald eagle and crows in our big oak tree by the sea. A caw-caw-phony of crow calls often warns of the eagle's approach, and the crows sometimes work together to try to drive the eagle away. Natural ice carving of a bird, also from a Dec. 25 walk. An especially low tide (before the snow fell). We saw this vertical ice-crystal rainbow one morning this week. It's called a Sun dog, and it's created by sunlight hitting fine ice crystals nicknamed diamond dust, which act like prisms. It can happen in very cold weather. Natural tinsel? The big chill has set in for New Year's week. “The park is far north on the eastern shore of Hudson Bay and is a jaw-dropping six and a half million acres in size. In short, this new Tursujuq National Park is the size of the state of Vermont or three times the size of Yellowstone National Park. The new park is on the eastern side of Hudson Bay, near that half-moon-shaped shoreline. “That’s room for a lot of birds. Those common redpolls that many of us have been enjoying at our feeders this winter may have come from there. Same with the common mergansers that we saw on the Kennebec last week. And the long-tailed ducks and black scoters in Linekin Bay. "The list goes on and on. In fact it goes on to include at least 130 birds species, most of which pass through or winter in Maine. "The new park likely supports millions of birds, the same birds we enjoy in our backyards, fields, forests and shores in migration and winter. "Tursujuq National Park will be one of the rare parks in the world that also includes virtually the entire drainage of several rivers. One river, called the Nastapoka, supports a population of the small, white Arctic whales called belugas. One of the things we find so interesting about what the park protects is its population of a mysterious and rare form of landlocked, freshwater harbor seals." 89: The introduction by ResearchGate, a powerful social media outlet for scientists (membership: more than two million), of a social-media-driven peer-review process aimed at replacing the traditional, more closed process of reviewing research by experts in scientific journals. 88: The fears of a human pandemic raised by strains of the avian flu that two virologists engineered to spread through ferrets as part of a research project. The strains were ultimately determined not to be fatal to humans, but the debate continues about the dangers of engineered viruses. 87: The discovery that certain bacteria survive particularly harsh conditions on the ocean floor "by going into a kind of suspended animation, perhaps the minimum amount of energy required for survival," writes Discover. The bacteria studied were living in nutrient-starved red clay 100 feet below the bottom of the Pacific. Their metabolic rate was a one-hundred-thousandth that of a typical surface bacteria. 86: A surprising psychological study of children ages 3 to 5 that found that self-control—the willingness to not eat one marshmallow now in order to get two later—reflects a child's experiences in dealing with shortages and deprivation. As Discover summarized the result: "If you can't count on that second marshmallow [ever coming], why wait?" 85: An important study of the thin upper atmosphere (50 to 80 miles above Earth) that revealed new information of the wind currents of the upper jet stream, which in Discover's words, "zip along at more than 300 miles per hour and generate electrical currents that surround the Earth…. [That electrical activity] can interfere with signals from satellites and spacecraft." 84: The unearthing in Myanmar (Burma) of a 100-million-year-old spider and wasp encased in tree resin. The presence of a second spider's leg in the amber suggested that the spiders were social animals. 83: A jump in the number and contributions of "citizen scientists"—average people who contribute to our knowledge of the world by doing everything from participating in bird counts to studying the stars with their personal telescopes. Discover notes that "volunteers sifting through open-source genetic dada on their home computers identified more than 200 new gene variants within the most common Y-chromosome type in Europe." 82: The rise in the number of cases of whooping cough in the U.S.. The total of 34,000 cases in the first 10 months compares to a low of about 1,000 back in 1976. The overall picture still is better than it once was: In the 1940s, Discover writes, whooping cough (aka pertussis) killed about 4,000 Americans per year; in 2011, 13 Americans died from the illness. 81: The crash to Earth of a $160 million Russian space probe that was supposed to go to Mars and collect soil samples. 80: New research into the role of genes in common diseases. Writes Discover: "Ten thousand years ago there were just 5 million people on Earth, fewer than live in Singapore today. The population has since soared to 7 billion. This rapid growth has left a mark on the human genome, researchers are finding, drastically increasing the number of very rare mutations in our DNA. That realization casts doubt on the long-standing view that just a few genetic mutations underlie many hereditary diseases. In reality, those diseases are probably caused by a wide variety of extremely rare mutations that vary from one person to the next, complicating efforts to understand and treat them at the genetic level." From the brain section at this year's Notebook. Answer to the Last Puzzler Yes, those mallard ducks that hang out in the bay by our house can drink sea water. They have evolved glands that filter out salt (and that grow larger if they are residing on salt water rather than on fresh water).